Analog and creative film rendering software. Rediscover the style, the colors, and the grain of legendary analog films, faithfully thanks to DxO's exclusive calibration process. Combine many original renderings with filter, vignetting, blur, texture, frame, or light leak effects to give your photos a unique look. Now supporting RAW format, DxO FilmPack uses the calibrated data from your camera to apply analog renderings with perfectly faithful colors. Based on all of DxO's RAW processing know-how, DxO FilmPack automatically corrects all of your equipment's possible optical flaws, all while efficiently reducing the undesirable digital noise in your images. And of course, processing TIFF and JPEG images is always possible! DxO FilmPack renderings are created in DxO's laboratories using an exclusive scientific process of exhaustively profiling each film. This process is based on a series of shots of specially-calibrated targets and as well as real-life subjects taken with the film being profiled. The film is then developed by the world's most reputable processing laboratories and is then subjected to high-resolution digitization in order to measure the film response and to extract the grain matrices. Process your images even more easily, thanks to DxO FilmPack's new interface - even more simple and intuitive! Quickly access all presets, effects, and settings grouped together in the unique lateral control panel. Select the style that best matches your taste: analog film or Designer, color or black & white, with or without a toning effect or a frame - the combinations are infinite! Click on a thumbnail: the processing is applied immediately. 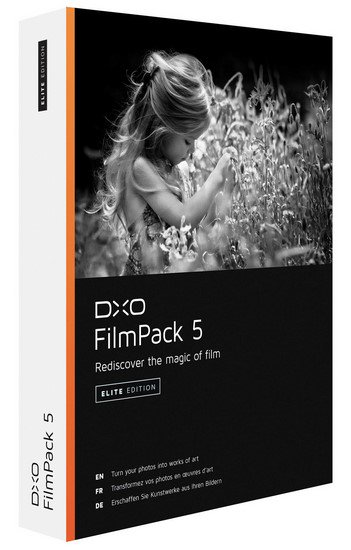 - DxO FilmPack is available in English, French, German, and Japanese.